When the Runner encounters Information Overload, trace – if the trace is successful, give the Runner 1 tag. 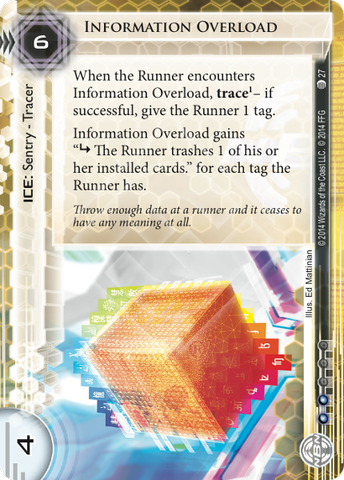 Information Overload gains "subroutine The Runner trashes 1 of his or her installed cards." for each tag the Runner has. Throw enough data at a runner and it ceases to have any meaning at all. I have played this card for 2 store champ seasons. And, in both of those store champ seasons, it's helped me take first place. It's jank, but it's funny jank that can have a place in a deck. This is a Johnny card. It, on it's own, is bad. One encounter, it will tax the runner 1 credit unless you boost and then they have to trash 1 card if they both take the tag and can't break it. This will never help you while behind which is something you typically want in most cases. It's real strength is being turned on when most of your other ice is turned off. In any NBN tagging deck that aims to win by forcing the runner to eventually get tagged beyond being practical to clear, the runner is going to be making runs against centrals to try to steal the points they need there. And if you kept your centrals scary with tagging ice like gutenberg and data raven, they do nothing. If the runner has a medium, they will dig through your R&D fast and resistor is typically the only ICE that can slow them down. It's often described as a win more card, which I can't disagree with; most times you're already close to a win if the runner has 6+ tags. You've probably have the runner one the back foot, and in a neck and neck game, you might draw information overload when you still need to tag them so it's a dead card in your hand. I can't recommend the card if you want to make as brutally efficient as possible. But if you want jank, I can say it's always gotten laughs when the runner hit it with 10+ tags and no way to break it (and yes, even my opponents laugh when it hits them). It's a funny trap. Although trashing multiple programmes could well be devastating, actually pulling it off with Information Overload on its own is difficult. Firstly, you need the runner to be floating tags - multiple tags, ideally, since the Runner gets to decide what gets trashed - so before you rez, you'll need to have drawn the runner over tagging ice like Draven, Gutenberg, or Bandwidth. Giving a tag with Information Overload itself will be very expensive, what with the 6 rez cost and a base trace strength of only one. Finally, a 4-strength sentry dies so hard to Net-Ready Mimic it's not even funny. The only way I can see to make Information Overload useful is with a big nasty Midseasons. (Or I suppose with multiple City Surveillances firing over a couple of turns, a la NEARPADs). Get the runner floating 7, 8, 9 tags and all of a sudden IO is very scary indeed.